Lee Hsien Loong’s values: casinos, EP ‘wayang’, dishonorable son. In the past months, Lee Kuan Yew’s values were hot topics. Besides inherited some of the bad habits of Lee Kuan Yew”s values, what are Lee Hsien Loong’s values? The very first thing when he became prime minister, PM Lee introduced integrated resorts - casinos. In his earlier days of prime ministership, he already thought of a ‘get rich quick’ economic policy for Singapore. This is why he promoted casinos in Singapore. Not only in gaming industry, in housing industry we also see high price of Housing and Development Board flats. It is easy for government to make quick money in casinos, in housing, in banking, in telecoms, in road pricing … as far as you are the licensing authority. Recently, the government finds some innovative clubs also engaging in ‘get rich quick’ schemes by operating jackpot machines. However, clubs are losers as they don’t have the right to print the operating licences and clubs are subject to rules and regulations under the government. When we encourage Singaporeans to try their luck by paying $100 to get a licence to pay at casino, we are telling people there is a way to make quick money even the chance is slim. However, some people do try and as a result, we see the increasing numbers of pawn shops. Lee Kuan Yew was against gambling. However, he eventually changed his mind because he saw the benefits that it could bring to the country. Perhaps, in this belief, Lee Hsien Loong also thinks 38 Oxley Road can be preserved. But as seen in gaming in casinos, the outcome is not always positive, sometimes, it depends on your luck. The Elected President wayang is a continued play of licensing. The People’s Action Party has the licence to direct the wayang. The elected presidency was Lee Kuan Yew’s initiative. Then, Lee Kuan Yew was worried about the growing support for opposition parties among Singapore’s voters, however, he thought the office of the elected presidency could prevent a profligate opposition government from touching the island’s vast monetary reserves. In LKY’s famous quote: ‘Without the elected president and if there is a (general election) freak result, within two or three years, the army would have to come in and stop it. In LKY’s evaluation, EP must be a person who can safeguard the reserve and understand and know how to read financial reports. However with a reserved EP, we are not getting the best and capable person to serve. It is even working in concert with the government. Is this the same EP value that LKY trying to promote? By denying the EP value of LKY, Lee Hsien Loong has to acknowledge the EP is a policy mistake. He is introducing the wayang EP to correct LKY’s mistake, just like the Ministerial Committee on 38 Oxley Road. Not to forget PM Lee has the licence to do so as he is the head of the government. Under the licence of ‘ownself defend ownself’, the parliament clears PM Lee’s abuse of power allegation. However, the title of dishonorable son remains. For traditional Confucian values, dishonesty is even worst than power abuse. A dishonest person can do all bad things, including disloyalty, abuse of power, corruptions, etc. Since Han dynasty, ‘governed by filial piety’(以孝治国) had been a key principal value even though not all emperors were dutiful sons. [The rule of virtue, which is the characteristic of the ancient Chinese society, "to rule the world with filial piety" is the concrete embodiment of governing the country by morality. The so-called "rule the world with filial piety" is to regard filial piety as the policy and principle of governing the country, and integrate the filial piety into the practice of governing the country. PM Lee, as criticized by his siblings as dishonorable son, has a long way to clear his name and the licence to rule. It is very unusual for an eldest on not being the executor and trustee of her father’s estate in Chinese tradition. In dynasty history, it means the successor has lost the authority to rule. In the eyes of Lee Kuan Yew, his final decision and clear message to Singaporeans are Lee Hsien Loong is not the successor of Lee family. The Relevancy of Lee Kuan Yew’s values to Singapore after the Oxley drama in Parliament. PM Lee Hsien Loong has declared success of clearing all doubts about Oxley drama related allegations. His explanations in parliament suggest his version of Lee Kuan Yew’ values and its relevancy to Singapore and future Singapore, including the privilege of kinship. Parliament may give the benefit of doubt to PM Lee, but have we had a clearer picture of Lee Kuan Yew’s values now? Or, are we confused? Are we confidence or the public have confidence that we can uphold these values? This is a question remain to be seen, especially among intellectuals and elites in Singapore. Will they, like the Parliament, also give the benefit of doubt to PM Lee or think otherwise? This is a serious question. The People’s Action Party needs to attract the best in society to be their election candidates. Over the years, we have seen their quality declining even the PAP claims their candidates are the best in Singapore. Of course, they always stress that there is no alternative team. Or Singapore can’t afford to split their best team into two. Checks and balances are important under the Lee Kuan Yew’s values. However, the Oxley drama in parliament clearly shows a “ownself defend ownself” government. Do we deserve to have a PAP “ownself check ownself” government? 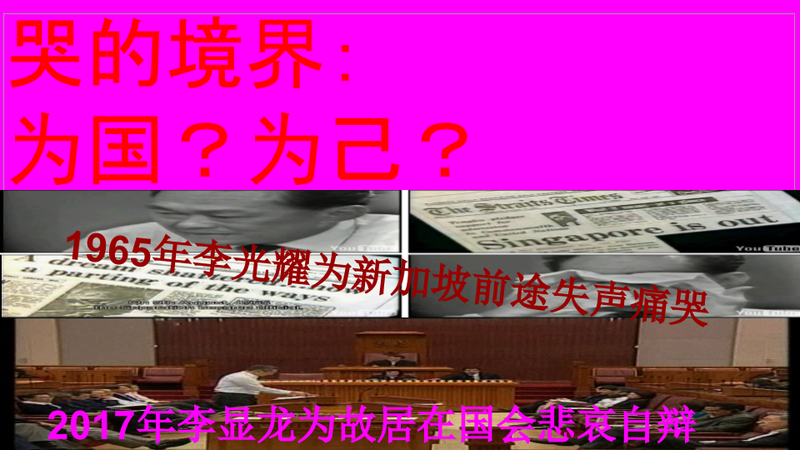 The Oxley drama as shown in parliament highlights an intellectual questions. How potential candidates think and evaluate the parliament debates and the unexplained doubts. Do they believe Lee Kuan Yew’s values are still in the safe hands of the current PAP leaders? Do they believe the allegations are ‘mostly inaccurate’ as claimed by PM Lee? Do they feel comfortable under the double-standard kinship working conditions where there is a big difference between brother or not brother? Many Singaporeans may not be able to fairly judge the Oxley drama, especially, if they only read and listen to the mainstream media. But those who want to stand as PAP candidates will have to think twice. From their hearts, do they really agree with Lee Hsien Loong’s version of Lee Kuan Yew’s values and the way he tries to safeguard these values? Perhaps, the only return that Singapore gains from the Oxley drama is the enlightenment of intellectuals and elites. These people who can make changes and lead Singapore must evaluate Lee Hsien Loong’s point of arguments. Some may choose to leave Singapore, like Lee Hsien Yang. Some will go into deep thinking when the PAP approaches them as candidates. Hopefully, some will join the oppositions to strengthen the checks and balances in parliament. Lee Kuan Yew’s values need urgent review and reform too. But PM Lee and his siblings may not agree to this, even though they disagree with each others. And perhaps, Kenneth is right.